Don’t panic, we’re here to help! 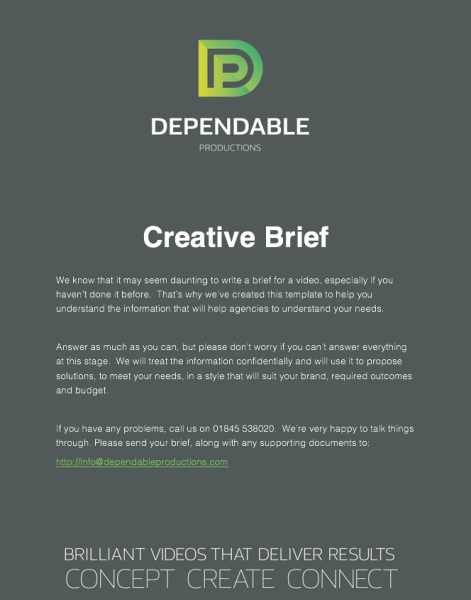 Writing a creative brief may seem a little daunting but it doesn’t need to be. This article provides you with some helpful guidance about the things you need to think about when commissioning a video. You can also download our free briefing template word document by clicking on the link to the right. It’s a simple questionnaire which covers everything you should consider before producing a video. A video brief is a bit like an architect’s plans – and you wouldn’t build a house without plans. So don’t make the same mistake with video. You need to give careful thought to your project’s objectives and provide any production company you work with with a clear brief. The points below are all the things you need to consider and answer when briefing a production company. What do you want to achieve? This is the most critical question. The answer should inform every step of the production process. You need more than a video, you may need more sales, brand or product awareness, consistent communications, increased fundraising or a training outcome. Define your requirements in terms of outcome, not the nature of the video. Audience. Ask yourself who the film is aimed at and then keep them at the forefront of everything you do. Is the film aimed at your staff? Your clients? New customers? Consider what they need to know and what style would grab their attention. Message. Keep thinking about your audience. Then write down the key messages you want to get across. That could be your brand values, training points or tips, internal changes, USPs etc. Your film needs to illustrate each of these points clearly or its message will be lost. And take care to keep those messages as timeless as possible unless you want to have to do another video in a few months. Barriers. Consider the things that might stop your message getting across to your audience. It might be a lack of time to watch a video – in which case keep it short. Is the subject very complicated and difficult to understand? In which case you need to keep it simple. Perhaps they are a cynical crowd – in which case peer to peer messaging is likely to be better than a missive from the boss. Who delivers that message? Is it the boss? the staff? perhaps it’s a presenter or actor? It might be an animation – a great way of making the complex simple. There’s no right or wrong answer. But be honest and fair in your expectations of others. Your CEO might be the global expert in their field but do they have the personality to deliver to camera and sell your message? If you are making a promotional video, there are few things more convincing than hearing great testimonial from a happy customer or client. What feel do you want it to have? Remember a video is like your virtual shop window to both an external and internal audience. It can make a great first impression. Or not. Your video should reflect your ethos or brand. If your video looks amateurish, so will you. You might love the idea of funky graphics and fast music but what if your audience is elderly life insurance customers? At the other end of the scale, a standard talking head video might struggle to engage as a training video. So consider your audience and think about the feel of the film. Where will it be watched? More and more videos are being watched “on the go”, on smart phones, tablets or laptops. But if it’s a training film, then that’s more “appointment to view” style watching. Where a film is watched will dictate its format and length. For example you could consider making a 2-3 minute film for the web about your services but a 30 second soundbite version for Twitter. You might also want to consider different versions of the film. Many films can now be quickly re-edited into vertical friendly versions, which are easier to view on phones. Alternatively, a series of shorts for social media could also be transformed into a longer overview piece to use online or in presentations. A good production company should be able to offer advice on all of this. How will you get it in front of your target audience? There’s no point in ploughing all that energy into your film if it’s just going to get buried in the bowels of your internal hub or the internet. At the beginning of your project, you need to ensure your carefully crafted message reaches its audience and earns its keep. You might consider using the video in an email campaign or even a targeted pay per click campaign on social media. A decent production company should be offering advice on getting the most out of your film.